George B. Munson, age 88 of Naperville, IL, passed away peacefully, Monday, January 28, 2019 at Arista Care of Naperville. He was born February 21, 1930 in Geneva, IL to his loving late parents William and Agnes Munson. Cherished husband of Carolyn J. Munson, nee Riedy. Beloved father of Francis Munson of Naperville, Catherine (Glenn) Skawinski of Manitowoc, WI, and Daniel (Valerie) Munson of Naperville. Adored grandpa of Mark and Paul (Alex) Skawinski, Philip and Jenifer Munson, and Jacob and Joshua Munson. Dearest great-grandpa of six. Fond brother of Edward (Jean) Munson of Long Island, NY, Irene (the late Ray) Cardinal of Long Island, NY and Evelyn (Leonard) Lucarelli of Eau Claire, WI and the late Ethel Love. Dearest uncle of many nieces and nephews. George grew up in West Chicago, IL. After graduating from high school, he joined the US Army. Upon discharge he worked for Peoples Gas Co. before starting his own small typesetting business. He married Carolyn Riedy in 1955. 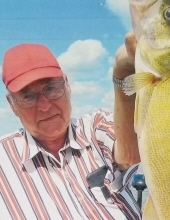 George was an avid fisherman and enjoyed snowmobiling, golfing, card playing and bowling. Visitation: Friday, February 1st 3:00-8:00 PM at Friedrich-Jones Funeral Home & Cremation Services, 44 S. Mill St., Naperville, IL 60540. Mass of Christian Burial: Saturday, January February 2nd 9:30 AM at SS. Peter & Paul Church, 36 N. Ellsworth St., Naperville, IL 60540. Interment will follow at SS. Peter & Paul Cemetery, Naperville, IL. To send flowers or a remembrance gift to the family of George B. Munson, please visit our Tribute Store. "Email Address" would like to share the life celebration of George B. Munson. Click on the "link" to go to share a favorite memory or leave a condolence message for the family.